EA strolls to another easy win in the absence of a serious challenge from Pro Evo. An epic ode to the joy of football, but with room remaining for improvement. From George Best, through Gazza, to Adriano, every footballing generation has its own cautionary tale. These mercurial talents are so full of promise, capable of unbelievable skill and destined for even greater glories. Then, usually due to the temptations precipitated by fame, and possibly dispensed as a liquid or powder, the player self destructs, ends up broke, sick or worse. But surely that won't befall EA’s seemingly immortal FIFA series. Well, probably not so long as its rival keeps making mistakes like the Aston Villa defence. Remember Villa? Nonetheless, it feels like there’s a growing risk that FIFA will never quite hit the gameplay peak that its sumptuous off-the-pitch features deserve. Which is slightly frustrating, but far from a disaster. As expected, this season FIFA is better. It’s better than FIFA 16, and it’s also better than Pro Evo 2017—or it certainly is on the PC. It’s better than a frozen Sunday morning on a five-a-side pitch. 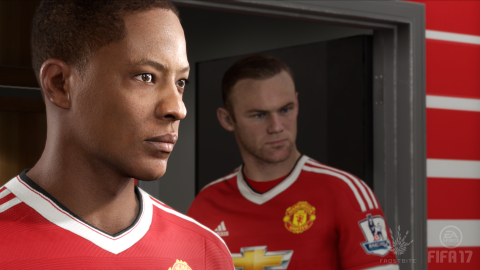 FIFA 17 is bigger, more beautiful, and better generally. It’s got more new features than Leeds have had managers in the last year—and some of them are class. One or two are, however, not class. This year’s game runs on the Frostbite Engine for the first time, just like Battlefield 1, which does take a little warming to. The crossing feels more like Gary Lineker in pants than Jamie Redknapp in a fitted shirt. It’s too easy to loop the ball into the air like that spoon-footed guy your brother brought to fill in at right-back while Jinky Geoff recovers from his vasectomy. There’s also a new Active Intelligence System, which sounds like something that tracks aerial threats and downs them with a surface-to-air missile. In practice what it actually seems to do is sporadically prevent your team-mates from making intelligent runs. Not much of a game-changer as far as I can discern then, but elsewhere there are plenty of positives. Player collisions are the best I’ve seen in a football game, though the alchemy behind them is tricky to discern. It’s probably something to do with the trumpeted Physical Play Overhaul. The result is that you’re now rewarded for relentlessly battling for the ball or stretching a leg out to deflect a pass when closing down an opponent. 21 years on, it’s actually reminiscent of FIFA ’96, which felt like a dreadful grind but rewarded doggedness as a counterpoint to the game-dominating trinity of pace, power and footballing celebrity. Topical reference there. The act of converting kids’ pocket money into a massive mountain of gold has been refined to an artform. Compare FIFA 17 with FIFA 16 and the early signs are it will have the same longevity, the same appeal as an online experience, and the same power to ruin Sundays you should have spent preparing for that big presentation at work. (Just use last year’s slides and change the date.) And when I say early, I mean 40 hours in. Because until I make it to division one of the attritional but glorious FIFA Ultimate Team Mode it’s hard to say with complete certainty. The big news for FIFA solo players this year is the inclusion of a story mode, which I’ll admit I was pretty skeptical about. But, to my surprise, The Journey—which immediately brings to mind a tragic X-Factor contestant montage underscored by Coldplay—is good. You guide plucky young phenom Alex Hunter from his under-11 cup final to the highs of a career in the Premier League. Through dialogue choices you forge his personality, negotiating personal difficulties, footballing trials, loan spells and other career-defining moments. It’s a very welcome additional way to play. FIFA Ultimate Team (FUT) will remain everybody’s mode of choice, though—not least EA’s. Here, the act of converting kids’ pocket money into a massive mountain of gold has been refined to an artform. The volume of trading in the marketplace for players reflects a gaming economy that is probably now worth more than Paul Pogba to the publisher. For FIFA 17, FUT has been tweaked with some new competitions and the inclusion of a mode where you can trade combinations of unwanted players for rewards. It’s still laborious to manage your team, despite some improvements to menu systems, and the churn of acquiring player contracts continues to feel uncomfortably reminiscent of the much-maligned freemium model. Unsurprisingly, FUT’s key new features seem designed to relieve you of more cash, by offering incentives for you to go out and buy obscure players for which there was otherwise little demand—you know, third-tier Algerian left-backs and such—thereby injecting even more activity into the market. That said, FIFA is a wealthy but largely benign dictator. A particularly pleasing returning feature is a cumulative system that recognises and rewards your own fidelity to the series. Your level in the game carries over from previous versions, and with that comes an instant shot in the arm with free unlocks that dramatically reduce the grind. These include star player loans, attribute boosts, and serious points multipliers to make acquiring the dosh you need to buy big in FIFA much easier. In the end FIFA wins because it keeps on giving. And this year is no exception.